Hi, everybody! I’m so glad you stopped by today! Since I’m a guest designer this month at Your Next Stamp, I’m joining in the blog hop to celebrate their December release! You’ll find the full list of blogs in today’s hop at the bottom of my post, and make sure to visit each blog (and leave a comment) for your chance to WIN a $20 gift certificate to the YNS Store! I’ve made a couple of cards to share with you today! The new stamps are adorable and are super-fun to color…they are perfect for creating cards, tags and other projects for the holidays! My first card features “January” and her little penguin pal. I also used some of the Sparkly Teal Gumdrops to embellish my card. My second card features “Aspen“. I used some of YNS’s Carribean Punch Glittered Gumdrops to accent a few of the snowflakes on the patterned paper. You’ll have until December 9 at midnight (EST) to visit all of the blogs in the hop and leave your comments for your chance to win the gift certificate! Winners will be posted on the YNS blog before the DT Dare challenge on December 11! I hope you’ve enjoyed the projects I shared with you today, and I’m glad you stopped by! Be sure to leave a comment for me before you hop over to the next blog to increase your chance of winning the $20 gift certificate to the Your Next Stamp Store! Both are cuties with all the patterned paper mixing together! The gumdrops really make the snow pop – fabulous idea. OMG…January & Aspen are both adorable!! I LOVE the papers you used on both your cards!! Both of these cards are darling creations! Those teal gumdrops are a very cool addition, too. Aspen's background paper is a perfect choice for her scene! Congrats on the Guest Designer spot! Your cards are awesome, love these new little cuties! Oh La La! Both are pretty creations with adorable backing papers and fab design and the addition of gumdrops arean elegant touch! Two wonderful cards. I LOVE pink!! WOW! Look at the gorgeous way you colored black hair! Really a wonderful job!!!!! Both cards are beautiful. I love the little critters — adorable! Super cute cards. Love both. Those are both just darling! Love the colors and those images are too cute! Both so cute! Your colouring is amazing! Awww . . . these are both so adorable! These are both so cute and totally delightful! Awesome cards Suzanne. Love them both! Really nice cards! 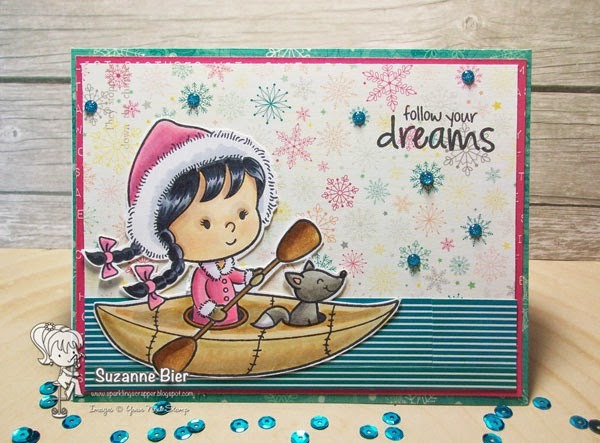 Love your colour choices and the stamps are great! Love the layering on the cards. The water under kayak is a fun idea. Very cute images and such nice cards. Love the patterns, colors and textures of both cards. both cards are soooo cute!